France’s Ambassador Jean-Marin Schuh after presenting the award to Kumaratunga. Picture by Rukmal Gamage. 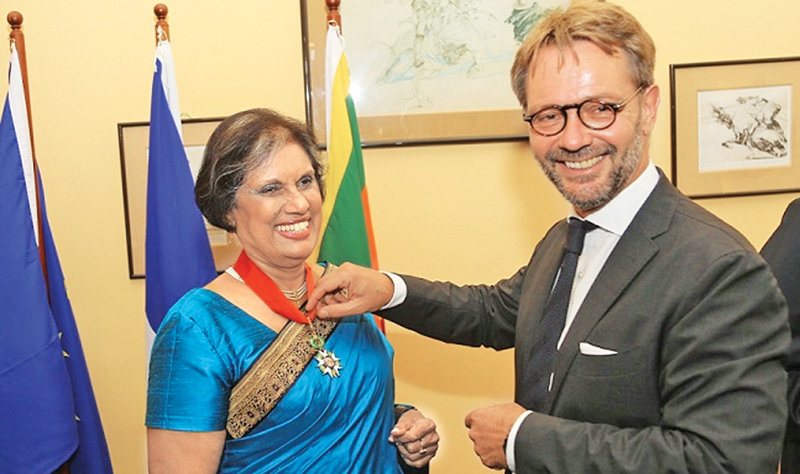 Former President Chandrika Bandaranaike Kumaratunga became the first Sri Lankan to be awarded the Prestigious Medal of Commander in the National Order of the Legion of Honour, the highest rank of the National Order of France. Ambassador of France to Sri Lanka and the Maldives, Jean-Marin Schuh presented the Medal of “Commandeur de la Légion D’Honneur” on behalf of President of the French Republic, Emmanuel Macron at a special function held at the Residence of the Ambassador of France. President Kumaratunga served as the fourth Executive President of Sri Lanka from 1994 to 2005. Prior to that, she has held the elected positions of Western Province Chief Minister and Prime Minister of Sri Lanka. At present President Kumaratunga holds numerous Honorary positions including being a Member of Club de Madrid (the premier global forum of former democratic Presidents and Prime Ministers), a Member of the Global Leadership Foundation (led by former President of South Africa F. W. de Klerk), was an Advisor and Member of the Clinton Global Initiative, and is the Chairperson of the South Asian Policy and Research Institute and the Office for National Unity and Reconciliation in Sri Lanka. She holds a Degree in Political Science from the prestigious Political Science Institute (Science Po) of the University of Paris and entered a Ph.D. Program in Development Economics at the École Pratique des Hautes Études, University of Paris, where she studied from 1970-1973. The event was attended by Diplomats, Ministers, Academics and Well-wishers.